Do you know what's in you credit report? Almost every credit report i look at with clients has at least one error in it. Did you know you can get a free copy of your credit report from each of the credit bureaus every year? Click the following link to get yours and if there are errors, mail a copy of the proof of the error to the company and ask them to fix it. They will send you a copy of their findings within 30 days! A little mistake can be the difference between getting a home loan and NOT! Most lenders require a 620 or above credit score for a mortgage. 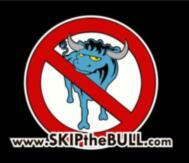 If you have any questions about Real Estate or Mortgage in Florida visit www.SKIPtheBULL.com/ContactUs 7 days a week!!! : "Over the year that it took to sell our house in Knoxville and buy a house in Winter Springs I had the opportunity to spend a lot of time with Richard Shuman. From the beginning he understood what we wanted to buy. He took us to a good selection of homes in Winter Springs and we managed to refine what and where we were hoping to buy. When our house in Knoxville finally sold Richard moved into high gear with us to find an excellent house and help us negotiate a good deal. He handled all the transactions, including our mortgage, with a high degree of professional competence and efficiency. Our closing went smoothly and effortlessly and we moved in just 7 days after closing on the sale of our Knoxville house. Perfect timing! My wife and I recommend Richard, especially to "experienced" buyers, because of his ability to quickly learn what the buyers are looking to purchase and then his laser sharp focus on helping them find it." Dave W.
"Richard was everything that I wanted in a realtor!! He listened to what I wanted and delivered. I flew in from Ohio for a weekend in order to buy a house. We went out and in one day had the offer accepted on a wonderful house. He continued to help me throughout the closing process and even set me up with a great insurance agent. I would definitely recommend Richard to anyone that is looking to buy or sell a home with out dealing with all the BULL!! Thank you so much Richard!!" Dr Marian M.
"Richard was very helpful in the search for our home. He went out of his way to take us around to different locations meeting our criteria, even one that was not on our list-which is the one we bought! He was very prompt in returning calls and aiding us with financing. He played the advocate for us with our mortgage lender. The whole process was pleasant and almost stress free." Amanda H.
Central Florida Real Estate including Seminole County Real Estate, Orange County Real Estate, Lake County Real Estate, Polk County Real Estate, West Volusia Real Estate and Osceola County Real Estate. Citys include but not limited to Oviedo Real Estate, Winter Springs Real Estate, Winter Park Real Estate, Lake Mary Real Estate, Casselberry Real Estate, Altamonte Springs Real Estate, Orlando Real Estate, Chuluota Real Estate, Sanford Real Estate, Clermont Real Estate, Davenport Real Estate, Apopka Real Estate, Deltona Real Estate and Debary Real Estate as well as most others in Central Florida. Homes in Live Oak Reserve, Stoneybrook, Eastwood, the Sanctuary, Lake Jean, Oviedo Forest, Oviedo Park, Carillon, Winding Hollow, Baldwin Park, College Park and most others!! !